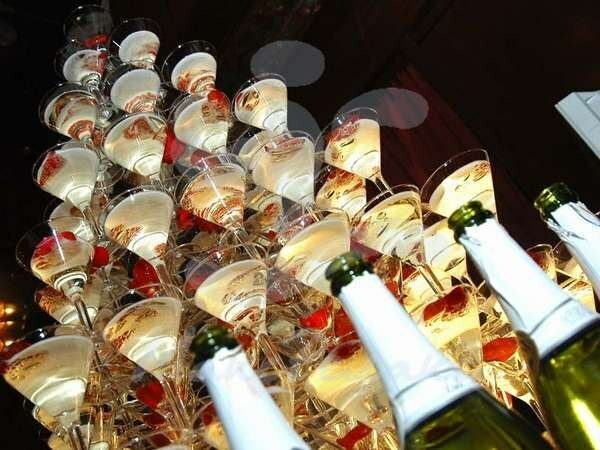 Pyramid of glasses of champagne – an indispensable detail of the lavish wedding, anniversary or presentation. It can be enjoyed in the festive Agency, but may be constructed independently. A few packages of inexpensive glasses, bottles of champagne, a little patience and you will succeed. Decide what the size of the future pyramid (or, as it is called, slide or cascade of champagne) you are interested in. The number of glasses is determined by the number of guests. Professionals build the pyramids out of a hundred, two hundred or more glasses. The beginner is better to start with a relatively low design – for example, of the 35 or 55. Note that the construction of such a cascade will take time – at least two hours. Decide on the amount of consumables. Stick to formula for every 3, 5 of the glass pyramid will need 1 champagne bottle of 0.75 liters. Accordingly, at the pyramid of the 55 glasses purchase 16 bottles. Choose suitable glasses. The best option for cascade – wide glasses-"saucers" or a Martini glass. They are resistant and look more spectacular than the narrow wine glasses-flute. Buying dishes, buy a few extra containers just in case a few pieces break. It is not necessary to spend money on crystal – pyramid perfect cheap glasses. Take care of the sustainable furniture – it depends on the reliability of the whole structure. More colorful of all the hill looks at a small round table, covered with a white tablecloth with a special "skirt" (a draped cloth completely hides the table legs). Start building the pyramid - for example, a spectacular cascade of up to 55 glasses. Install the tray table – it will protect the tablecloth from drips of champagne. Install the lower tier in the form of a square with sides of 5 wine glasses (25 pieces). Put them close to each other, even in parallel rows. Align the series with a piece of cardboard. The second row of the 16 glasses placed so that each of them was bottomed on the upper parts of the four glasses of the lower tier. Install them evenly, slowly, observe the parallel rows. The third row is made up of nine glasses, the fourth of four and completes the pyramid last glass. Slide ready. It can be decorated in flower petals and dry ice in separate containers (it will be effectively to smoke). On the tablecloth in artistic disorder laid out chocolates or other small ornaments. When guests fill the fountain. Champagne, watch the bottle of the bottle is poured into the top glass and gradually fills the glasses of all tiers. If you doubt that you'll cope with a glass slide, practice on plastic cups with water. The slide can be constructed of glasses with a cocktail. In this case, the drink can be dispensed in advance, with 2/3 of the wine glass and decorated with cocktail cherry.